I’ll be speaking at the University of Iowa this Friday, Feb. 25th, at a symposium on IP law called Intellectual Property: An Interdisciplinary Conversation. I’m on the “Fair Uses” panel, at 11:15am, with Siva Vaidhyanathan and others. Incidentally, the host for this conference is Kembrew McLeod, the man who trademarked the phrase “freedom of expression”, and the author of Freedom of Expression®: Overzealous Copyright Bozos and Other Enemies of Creativity. It’s about “life in the age of Intellectual Property Madness”, and it was both published by Doubleday/Random House and released under a Creative Commons license a week or two ago. Lessig recommends it! It also happens to quote me multiple times, as I mentioned in an earlier post, so go download or buy it, and look me up in the index! One of my quotes actually doesn’t appear in the index… I’m mentioned on page 220, along with Rebekah Baglini of Bryn Mawr Free Culture, in connection with the “Barbie in a blender” project. So yeah, if you know anyone at U Iowa, tell them to come check me out! I will be speaking on a panel at the 11th Rebellious Lawyering Conference at Yale Law School on this Saturday February 19th, at 4:30pm. I will be on the “Reclaiming Culture” panel (see the schedule), along with Siva Vaidhyanathan of NYU and Glenn Otis Brown of Creative Commons. If you’re in the area, please swing by and see me! If you come earlier you get to have lunch with the panelists, if you come later you get to party with… me, at least, I don’t know if the other panelists are hanging around, but I plan to attend the entire conference. Those who have been watching my blog closely may have noticed that this is not the first time that I’ve spoken Yale, and I hope that it won’t be the last! They seem to like me, and I certainly like them. 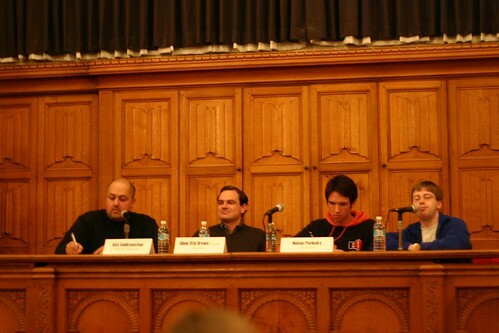 It’s certainly an honor to have shared a stage with Mike Godwin of Public Knowledge, Mark Hosler from Negativland, and DJ Spooky (that subliminal kid), as I did at the “Digital Mix” event. Besides, I get to hang out with cool Yale Law students like Rebecca Bolin and James Grimmelman, both of whom I met while interning with the EFF. If you come see me at Yale, you’ll get to meet cool people too! Just ask me if you need a place to crash for the conference if you haven’t got one already, I’m sure I could help you find something.